Complete renovation of an unfinished basement in a classic south Minneapolis stucco home. Truly a transformation of the existing footprint to create a finished lower level complete with family room, ¾ bath, guest bedroom, and laundry. The clients charged the construction and design team with maintaining the integrity of their 1914 bungalow while renovating their unfinished basement into a finished lower level. Love the TV stand/cabinet - Great great job! Do love the TV cabinet, do you have the source? Thanks. It's beautiful. I did go on the Shaw Website and I'm not seeing this available anymore. Do you know if it's available anywhere on the East Coast in particular? I love the variation in it! could you tell me the size of this room please. Thank you! Thanks for your question. I only have elevations indicating the bath ceiling height in this lower level. The bath ceiling height is 7'. I am assuming that the ceilings in the other rooms are close to that height as well. The lights are WAC #R5VI-S-ICA recessed lights with #R5VT-25 White Baffled trims and PAR3- 50W lamps. I hope this helps in planning your project. Floor? - What is this flooring? Hi @TheParscale thanks for your comment. Sorry to here you had trouble with your vinyl flooring. This laminate floor was installed in 2010 and has had no issues. What height is the bottom glass of fireplace off the floor? I am not sure on this exact information as it was several years ago but from looking at the picture I would guess approximately 30". 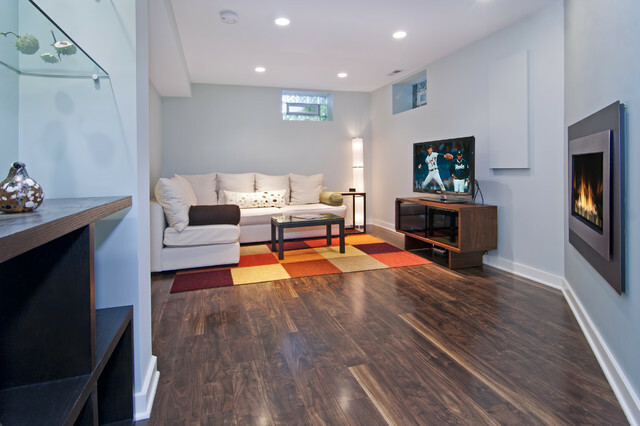 Thanks for your question about this great Lower Level family room by White Crane Construction. The wall color is Benjamin Moore Gray Cashmere #2138-60. Rug? - Is that a rug or carpet tiles? The colors are great, and I would love to know where to get it. They were purchased directly by the homeowner, so I do not know the exact color and style, but they have many to choose from that you can mix and match. Where can you get a fireplace like this? Thanks for your great question about this White Crane Construction project. This is a Valor H4 fireplace model #650IRN with Inner Copper Bezel Landscape outer trim in Vintage Iron Black fluted interior and river rock firebed. It has a remote control (standard), 2 Thermostat settings, and Variable flame. In Minneapolis you can contact Fireside Hearth and Home to order this item. Check with Valor for dealers in other locations. AFTER: The main living room in the basement is now open and clean, crisp yet comfortable. The designers paid careful attention to lighting, adding recessed lights and borrowing light from the guest bedroom to brighten the space.The clients entertain a lot, plus they have a dog and store their camping equipment down here, so the durability of the laminate flooring suited them. "The flooring is beautiful and tricks a lot of people into thinking that it's wood, and it is a little more moisture resistant than carpeting and pads for a basement," says senior designer Lynne Shears. As for the rug, the modern grid of Flor tiles mimicks the grid on the glass block windows. could have the tv on this wall? ?